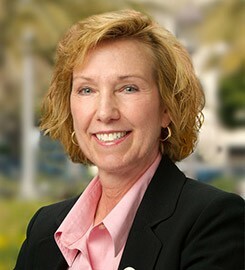 Lisa Baird, PhD, joined the biology faculty in 1988. In addition to teaching in the preparatory courses for biology majors, she teaches classes in plant physiology, electron microscopy and the senior seminar. Baird is a developmental plant physiologist with particular interest in plant stress responses to pathogens and insect predation and how these responses can be modulated by plant growth regulators. Baird’s research focuses on plant responses to environmental stresses, particularly pathogen invasion or insect predation. Her current work examines the mechanism underlying resistance of certain types of buffalograss (a native turfgrass) to predation by insects. The research uses a combination of physiological and cytochemical techniques to examine plant responses to insect invasion. She has published several manuscripts and has received grant funding from the National Science Foundation, Valent Biotechnical Division and Uniroyal Biochemical. A firm believer that students learn science by doing science, Baird directs many of her teaching efforts toward promoting an investigative curriculum in biology. She established and teaches a project-based course in electron microscopy and incorporates student-driven independent research in her course in plant physiology. She is currently working to develop modules for teaching writing and critical thinking skills to biology preceptorial students. She is co-coordinator of the SURE (Summer Undergraduate Research Experience) program which promotes undergraduate research across the college and the science coordinator for the Liberal Studies program. In 1997 Baird received the Davies Award for Teaching Excellence. Submit changes to Lisa Baird's profile.